BY-3500T CAME reliability for the maximum power. 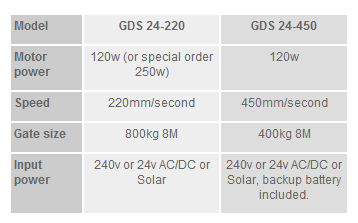 It is the ideal solution for powering gates of up to 3,500kg. Besides the normal command & safety functions, the new electronics supplied with the BY-3500T series provides certain special features such as: programming the command for particular opening of the gate, ideal for all entrances lacking a pedestrian gate; safety even when the gate is not moving because each command is over overridden if an obstacle is detected by the safety devices and gate. BY Series has been designed to operate gates up to 3,500kg. Ideal for frequent opening light & heavy commercial & industrial applications. Easily accessible, built in electronic control panel with integrated radio receiver. Easy key lock release through removable cover. Internal provision for Photo Electric Cells. Opening and closing speed 175mm per second. The electronics checks the proper functioning of all safety systems before opening & closing. Ditec specialises in supplying automations for types of gates. Sliding gates require flexible automations capable of managing different environmental conditions, all types to able to control various frame sizes, different transit rates and changing environmental situations, while always ensuring maximum operational safety, functioning and reliability. Cross 14 & 15 has been designed to efficiently operate large gates. Ideal for light & heavy commercial & industrial entrances. Opening and closing speed 200mm per second. Cross 30 has been designed to efficiently operate large gates. An industrial grade 3 phase inverter controlled drive motor to handle any intensive application (only single phase input required). All controls mounted in steel enclosure with a powerful microprocessor control board to provide various features required with the operator. Smooth, fully adjustable ramp up, ramp down, opening and closing speed for the ultimate in a gate drive operating control system. The IGD 550-450 uses a 550w motor with 450mm/sec maximum opening speed, manufactured to automate gates up to approx 800kg, has 240v 10A input power and a linear force of up to 80kg. Utilising a cast iron gearbox, steel chassis, inbuilt easy set limit switches, all electronic controls and inverter in steel enclosure and 100% duty cycle.Made in Australia from quality Australian and imported components. An industrial grade drive motor designed specifically for sliding gates working on a hill or rake. It is suitable for high usage areas such as apartment buildings or carparks but is most commonly used in domestic situations where the gate runs on a steep slope.If running power is a problem as can happen in an established area, the control box of the 24v DC system can be located several metres away from the motors and the motor cables can be sealed. OR the transformer can be located near a mains power supply and 24v AC can be used in a similar manner with the control box near the gate. Sturdy electro-plated 6mm thick Laser cut steel chassis and mounting plate. Utilises cast iron gearboxes with the ball & roller bearing assemblies. Drives unit has a unique mechanical torque limiter on the output drive to control the driving force of the gate. Operator is available in a choice of Rack and Pinion drive or Chain drive. Made in Australia from quality Australian and Imported components. An industrial grade 3 phase inverter controlled drive motor to handle any intensive application (only single phase input required). All controls mounted in IP66 steel enclosure with a powerful microprocessor control board to provide various features required with the operator. Smooth, fully adjustable ramp up, ramp down, opening and closing speed for the ultimate in a gate drive operating control system. 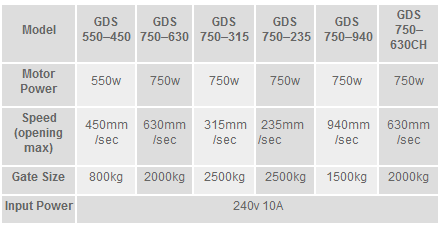 The IGD 750-630 uses a 750w motor with 630mm/sec maximum opening speed, manufactured to automate gates up to approx 2000kg, has 240v 10A input power and a linear force of up to 100kg. Utilising a cast iron gearbox, steel chassis, inbuilt easy set limit switches, all electronic controls and inverter in steel enclosure and 100% duty cycle.